In this bestseller John Maxwell examines the differences between leadership styles, outlines principles for inspiring, motivating, and influencing others. These principles can be used in any organization to foster integrity and self-discipline and bring a positive change. Developing the Leader Within You also allows readers to examine how to be effective in the highest calling of leadership by understanding the five characteristics that set "leader managers" apart from "run-of-the-mill managers." 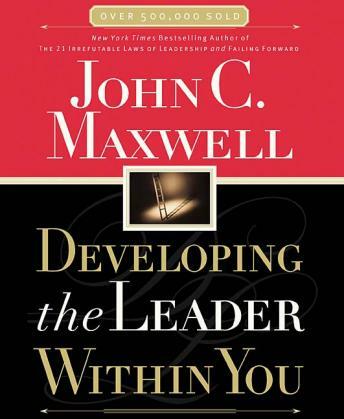 In this John Maxwell classic, he shows readers how to develop the vision, value, influence, and motivation required of successful leaders. To become the leader that lies within you, listening to this set is the first step. You will want to listen to it multiple times. It's that good! This one is a reiteration of things we already know, but which are good to have to think about again. Of course, some things are a bit simplified. Again, think of this book as an opportunity to focus on leadership issues for a little while and it'll be ok. I like all of Maxwell's work. A lot of his ideas bleed over into his books, but I think repetition is a key to learning; especially when you are listening and not reading. I am now listening to the 21 irrefutable laws. I highly recommend this book to anyone who wants to be more than a manager or who wants to really make a difference in the world. I actually went and bought the hard copy version for reference and so I could take down some notes. I thought that this book flowed very well. It was easy to grasp the concepts and I will be adding these new skills into my already succesful Arbonne business. Love the book!